Showcase your appreciation of cardinals by offering them their favorite seeds in the Heath Cardinal Stack'ms Seed Cake. This formed disc offers cardinals some of their favorite treats, like sunflower and safflower seeds, with peanuts and millet adding extra flavors. A gelatin binding keeps the item well formed and tidy, while a hole through its center allows it to be placed on the Heath Stack'ms Seed Cake Feeder with Roof (not included) in moments. The clever design of this tray provides plenty of seed for your feathered friends, while allowing you to watch the action all around it. Enjoy more cardinals and other songbirds dining in your backyard from the Cardinal Stack'ms Seed Cake. 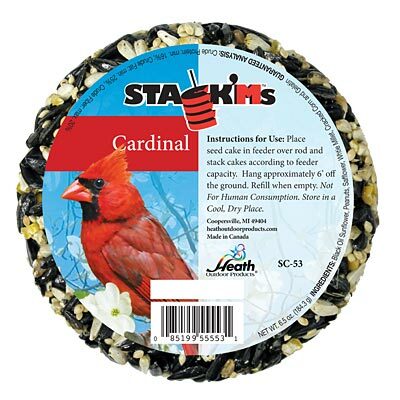 Note: This case pack includes 6 of the Heath Cardinal Stack'ms Seed Cakes, 6.5 oz. each.